Meridian Director DAC aims to be Sonos upgrade | What Hi-Fi? The Meridian Director DAC is the latest USB and coaxial/optical DAC from Meridian, offering "superior audio performance from digital sources" at a price of £449. 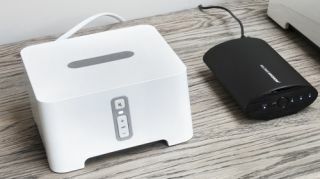 The Director will look to build on the success of the more portable Meridian Explorer DAC, with the Director aimed at upgrading home hi-fi systems and also devices such as the Sonos Connect, Apple Airport Express and Apple TV. The USB and S/PDIF digital inputs (there are adapters for connecting coaxial and optical cables) are joined by standard fixed line-level stereo outputs but there's no headphone output on this DAC. Power comes via USB or a supplied mains cable if needed. As on the Explorer, the Director offers 24-bit/192kHz support (though 96kHz is the recommended maximum for optical) and works with Macs and PCs, though drivers may need to be installed. Also on board is upsampling of your source material from 44.1/48kHz to 88.2/96kHz and an Apodising filter. Meridian says the Director includes design elements from the company's top-of-the-range 800 Reference Series, such as dual high-quality oscillators, which help to minimise jitter. Hand made in the UK, the Meridian Director is available to order now for £449.